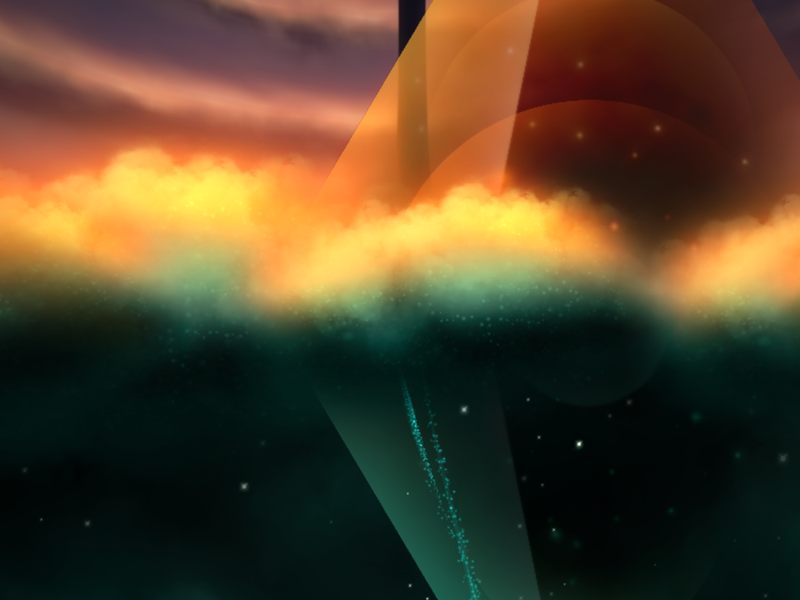 In Echostone Games’ magical new iOS game Gemini, you control a star on a journey with another star to “light up the sky.” It’s a story told without words, and yet it’s surprisingly powerful. The two stars must work together, because separately they can’t soar. I’m not sure how others will interpret it, but to me it’s about the importance of teamwork, expressed in a very unique way. The controls are simple, but not quite what they seem at first. You can only move the star left or right, by tapping the left and right halves of the screen. But your journey takes you up into the heavens, not on a side-scrolling adventure. So how does that work? The two stars must stay together in order to fly. Neither one is strong enough on its own. But in tandem, they shine brighter and can fly higher. The bigger star (you) sprinkles stardust on the smaller one, keeping it going. But the small star has a mind of its own and doesn’t always do what you want. So following it and trying to lead it where you want it to go creates a little dance, a little tango. 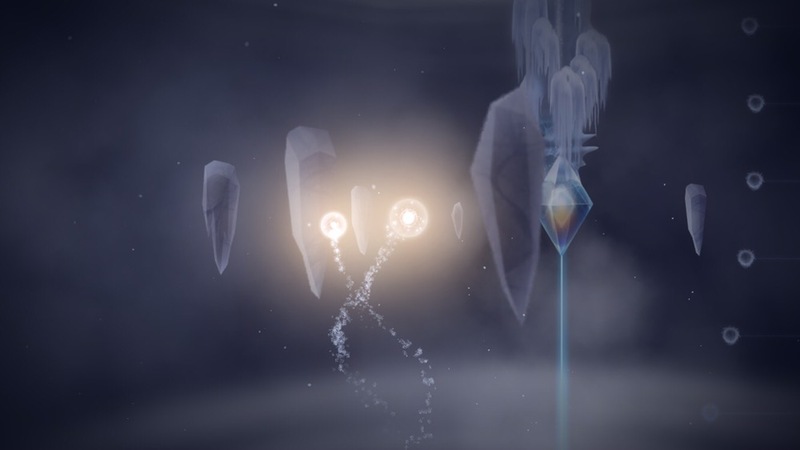 Your goal for much of the game is to navigate the two stars together so they can reach orbs and sprinkle stardust to ignite them. But there’s another catch. For certain parts of the game, the stars need to be close enough to a light source (usually one they lit up themselves) or they’ll go dark and start falling, even if they are close together. This mechanic sounds complicated, and it could have easily been frustrating in a more demanding game. But Gemini is meant to be relaxing and meditative. There’s no timer or penalty for fumbling with the controls. The worst that can happen is it takes you longer to get through the story. And with the visuals you’ll be rewarded with, that’s not such a bad thing. It may take a bit getting used to (and I sometimes accidentally mistake my star for the small star), but after some practice, you should have at least some handle on the controls. The game is broken up into six chapters, but they blend seamlessly together. 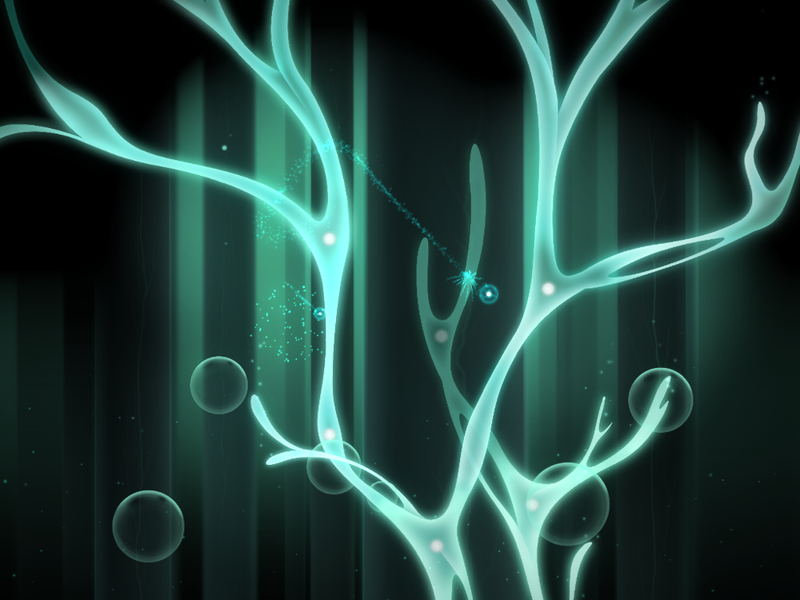 The style and layout remind me of Gathering Sky, another game that’s like interactive art. Once you complete a chapter the first time, you’ll be able to access it on its own whenever you like. So if you have a favorite area you can’t get enough of, you can spend as much time with it as you want. I’m a sucker for pretty graphics and, as you can see from the screenshots, Gemini delivers in spades. The areas you travel through are meant to mimic space and galaxies, but with some artistic license taken. I’ve played through the game several times now and I haven’t had enough of it yet. Together with the lovely soundtrack, it creates a meditative experience that’s a perfect fit for an iPad resting gently on your lap. And, like most games that are like interactive art, there’s a camera button that pauses the game and lets you share a scene from your journey with the menu buttons removed. I spent a lot of time taking screenshots this way, like I did with PRISM_, another gorgeous game with a similar theme. I played through the game on both my iPad and iPhone and it worked great on both. The controls are designed for a touchscreen and you don’t have to worry about on-screen buttons, so you can hold both devices however you’re comfortable and just use your two thumbs to control both halves of the screen. There’s no iCloud support, but the game is short enough that that shouldn’t be an issue. If you want to play it on both devices, just do so. But I do recommend an iPad if you have one, so you can get sucked into the visuals. I absolutely loved most of the game, even though it’s rather short. But I have mixed feelings about a certain chapter. It’s one of the prettiest parts of the game (but really, it’s all breathtaking), and perhaps the most puzzle-driven and game-y section. But oddly enough, I find it the least enjoyable to play. It takes place in a 3-dimensional space instead of 2-dimensional. That means you need to have a better handle on the controls here, because your goal isn’t to fly higher and higher. You’ll have to master that dance that allows you to reach any part of the screen that you need to, traveling up and down and around as necessary. This is because it’s the one level (from what I can tell) that has a solid, inflexible goal. You need to light up a number of shapes, which will then light up a symbol. There are about six or seven symbols, and the shapes can be a little tricky to find and maneuver around. There’s no partial credit here. You either light them all up or you don’t move on to the next area. So yes, for those who want more of a challenge, this level will give it to you. But even if it didn’t feel a bit tedious to light up shape after shape basically the same way, the music kills it for me. I don’t know what happened here. The rest of the music in the game fits the mood perfectly and, while it might be relaxing enough to put you to sleep, I didn’t find it boring. The instrumental soundtrack is an original one composed by Tony Yan, and he does a terrific job with it. But the music on this chapter grates on my nerves and makes me impatient. Instead of enjoying and relaxing with the visuals, the music makes me want to finish the chapter and get out of there as soon as possible. But it might just be me. I played it for a friend and it didn’t bother her. And it didn’t even really bother me my first time playing. But by the second time, I was hyper aware of it. That one style just doesn’t work for me, personally. You can see for yourself in this video below. I don’t recommend watching too much of it if you plan to play the game, as it will spoil it for you. As I mentioned, the game is short. It will take you roughly forty-five minutes to an hour to complete if you don’t fumble too much with the controls. But there is a bit of replay value. After you finish the single mode version of the game, you unlock two-player local mode. There are two options here — Hug Mode and Side by Side. In the former, you each control one star, but you have to use the left and right sides of the screen together. In the latter, you each control a star but you each get your own side and you swipe right to left on your side like you’re using a joystick. I tried to play with a friend who hadn’t played the game before and it was troublesome, so I would recommend playing with someone who already has experience with it. Also, it’s probably a good idea to make sure they’re not too tired to give the game the attention it deserves. Alternatively, if you want an extra challenge, you can try using both joysticks and control both stars on your own. I tried it for a little while and started to improve, but it’s much tricker than controlling only one. So if you found the single mode too easy, you can give that a go. I was both surprised and sad when I reached the end of Gemini, but I still very much enjoyed the journey, enough to replay it several times. The game costs $2.99, reduced from its regular price of $3.99. What you’re buying is a short, meditative experience that you can revisit as much as you want without worrying about in-app purchases. That won’t be enough for everyone, but as long as you know what to expect, I think you should be happy with your purchase. If you want several hours of play for $3, this isn’t for you. But if you’re happy spending $3 on a brief but unique and relaxing audiovisual experience, you won’t be disappointed. 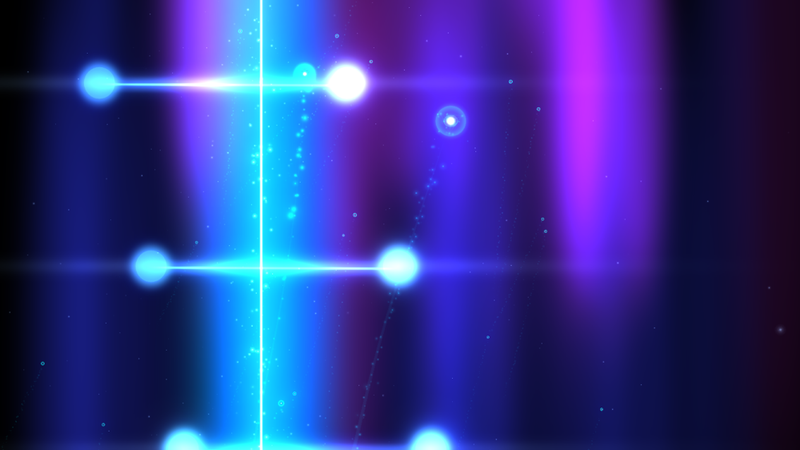 If it looks and sounds like something you’d enjoy, you can download the game here. If you’re already playing and need some help, try my Gemini walkthrough guide.